The faster you cut a part, the greater the stream lag and V-shaped taper in waterjet cutting. Slowing down the cutting speed can minimize these errors, but will add significant cycle time and increase the cost per part. 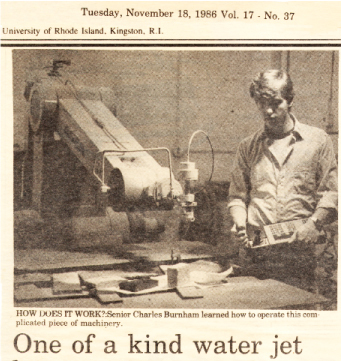 When I was just starting out in waterjet back in the mid 80’s, we put the waterjet on a pedestal robot and cut all kinds of things. The robots were designed for point to point (pick and place, they called it) motion, not path motion, so the parts didn’t always come out very accurate. It was very common that the inside corners of the waterjet cut parts would show “corner wash out.” To improve the inside corners and tight arcs, I had to insert points on the cut path leading in and out of tight inside geometry and manually enter sequential slow down segments into the corner (so the stream lag would reduce), negotiate the corner, and then enter sequential speed up segments out of the corner. It was arduous. The good news is it is not 1986. Although the most basic waterjets out there still force you to live with corner wash out, more advanced waterjet machines today have intelligent control systems with advanced algorithms that automatically add the speed changes to minimize the stream lag errors. 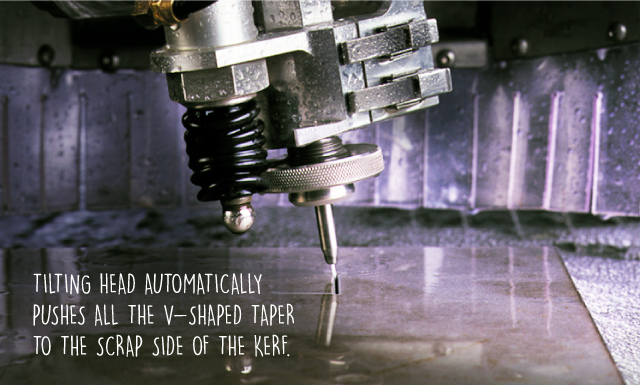 Just as some programmers learned to manually chop up segments in and out of tight geometry to minimize stream lag, they also learned that they needed to program tighter tolerance parts with slower feed rates to minimize the V-shaped taper. Typically a speed of 15 to 20% of maximum cut speed will produce a part with as little taper as you can hope for (not zero, but a couple of degrees). Similar to dealing with stream lag, I found in the mid 80’s that I could use my 5 axis pedestal robot to slightly angle the head by 3 to 10 degrees to compensate for the taper. This was extremely difficult to do – an order of magnitude more difficult than manually adjusting speed in and out of corners described above. In 2001 technology was released where an XY machine tool was equipped with a wrist that could angle +/- 10 degrees. The SmartStreamTM intelligent software had evolved to not only know how to slow down on tight geometry and speed up on straights, but it now had algorithms that accurately predicted and compensated for the taper. The cutting head was angled 1 to 10 degrees to eliminate the taper on the part and also angled forward to reduce the impact of stream lag. This video is a good visual for how this works. Those of you adding waterjet technology have three choices. You can have a conventional waterjet machine; a waterjet machine that has an intelligent control to slow down on tight geometry, thereby producing a better part at the sacrifice of cycle time; or a machine that controls speed intelligently and also tilts the head automatically to compensate for stream lag and taper while cutting much faster. Hope this was helpful. Feel free to ask me questions in the comments. reading them. I will look much smarter and at ease with the information next time I am asked to report. Glad the topics are of value. Your investigation comparing waterjet and laser is not unusual. Waterjet and Laser are complimentary processes – many of my customers have both. We plan to cover the comparison of WJ, Laser, Plasma, EDM (all nontraditional machining methods) in a future post concentrating on common materials. In the meantime, if you would like to describe your application I’d be happy to offer a realistic comparison if I am able. We did that , I met with Brian Sherick and we discussed the Waterjet and laser aspects. The real problem is not so much technical as political and a floor space issue. When the floor space is no longer an issue I expect someone from here will revisit to compare the latest technology since it appeared there were rapid advancements happening. The political issues will self correct with the aging of employees. I think death of long term employees is a large driver of new technology these days. I am knocking on wood as i type even though I have been the only shop foreman to bring in computer controlled equipment. Have you considered a Death Squad to supplement your appointment setters? Just a thought……sorry.